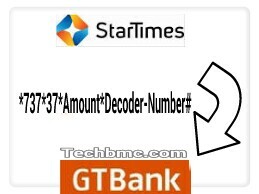 If you are using Startimes and at same time banking with GTBank, here is how to pay your subscription fee directly from your Gtbank Account without being to the bank or to the location of Startimes office. This post will guide you on how to pay the fee right from the comfort of your zone, by the use of short Ussd code. Read on to get the detailed guide. Before dialing the code given below, ensure you dial the code on that sim/mobile line associated or registered with your Gtbank account. This is done in order to avoid an error response after dialing the code. After the dialing, your Startimes sub will be automatically renewed without delay and your Account from GTbank will be debited accordingly. It's so simple to operate on. How To Activate Your Verve Card For Any Online Payment And Business Transactions In Nigeria. How To Transfer Funds, Buy Recharge Cards With Your GTBank Account Via Your Phone. Latest on Diamond, Make An Instant Transfer To Other Banks Live On Diamond ATMs. - it is very simple, fast, easy and reliable to use. - The process takes only few seconds to execute. GTBank stated it clear to her customers, that more bills payment service will be implemented on their system in no distant time. So stay tuned as we keep you updated on any information relating to that. Ensure to comment telling us your experience or question where you don't get clearly on this post, thank you.